The downpour began on 13 September, when the centre of Hurricane Florence was still hundreds of kilometres from North Carolina’s coast. As the giant storm lurched towards land, officials ordered more than 1.5 million people to evacuate, warning of “life-threatening” damage. On 15 September, Florence finally crashed into the United States, where it slowed to a crawl and unleashed even heavier rains. In some places, the deluge continued non-stop for four days. By the time it was all over, Florence had dumped record amounts of rain — including nearly one metre in the town of Elizabethtown, North Carolina — and caused catastrophic flooding. Dozens of people died, and the storm racked up tens of billions of dollars in damages. Even now, months later, the area is struggling to recover. The story of how Florence brought a thriving region to its knees is about to get a lot more familiar. Climate scientists expect that as global temperatures rise, much more rain will fall in extreme storms. The warmer the atmosphere, the more moisture it can hold, which means storms can get wetter. Even before Florence made landfall, a team based at Stony Brook University in New York predicted that the hurricane’s heaviest rains would dump at least 50% more precipitation than would have happened had people not warmed the planet. Extreme rains — along with the flooding, landslides and other devastation they cause — are some of the deadliest weather events worldwide. 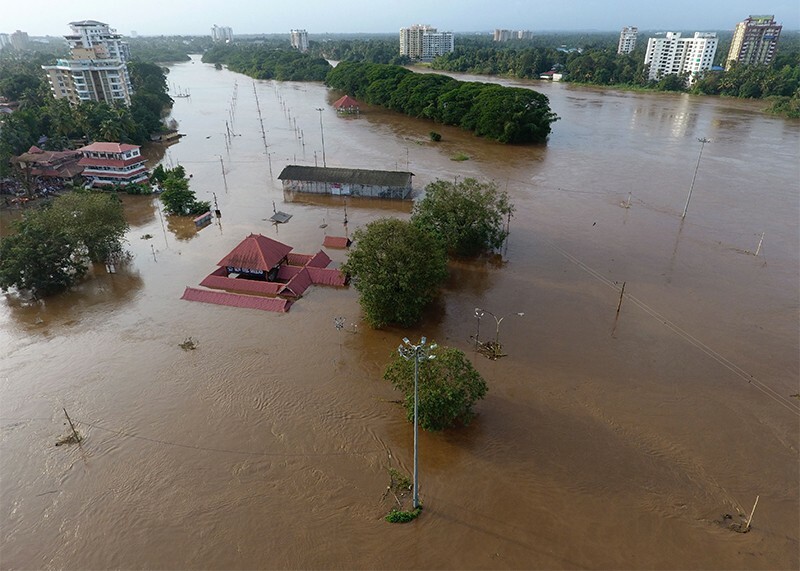 This year, heavy rains in the Indian state of Kerala killed more than 470 people, and flooding in southwestern Japan left more than 200 dead. In the United States, flooding, severe storms and tropical cyclones account for 9 of the 11 natural disasters that have topped US$1 billion in damages so far this year. 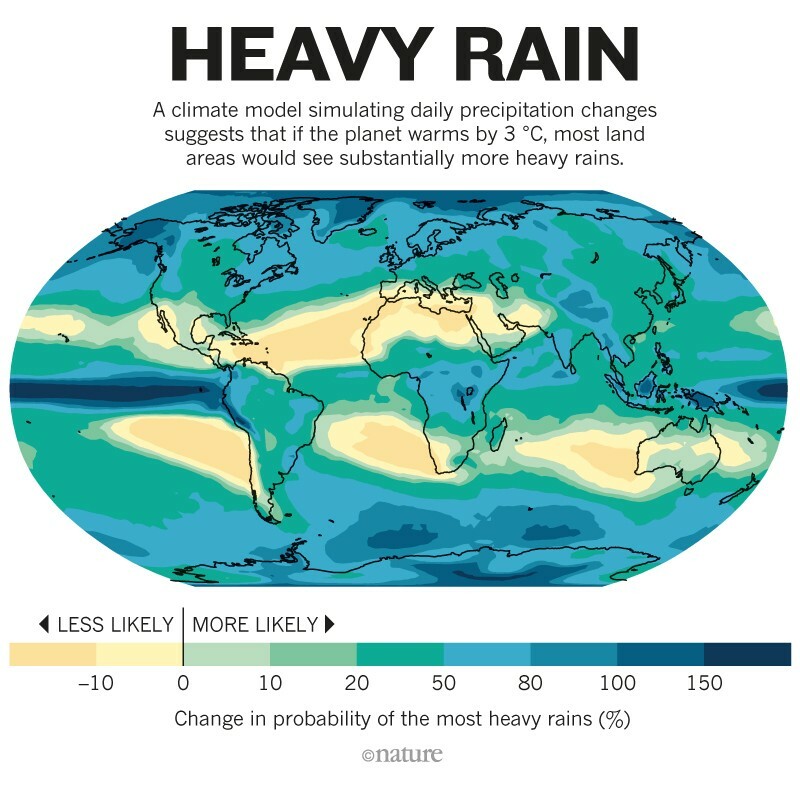 But forecasting how the most punishing rains might change in the future has been notoriously difficult, because scientists can’t easily simulate these storms in computer models. Now, many research teams are making advances in understanding the future of extreme precipitation across the world, thanks to models with very high resolution that can provide insight into how storms evolve. Some of the most sophisticated forecasts suggest that as the globe warms, more rains will fall in severe, intermittent storms rather than in the kind of gentle soaking showers that can sustain crops. Other research indicates that the ways in which thunderstorms organize themselves could change fundamentally, leading to bigger and more-powerful storms that could mean more flooding. In Kerala, it all started with a wet June and July, and accelerated over the following month. The first 20 days of August brought 164% more rain than usual. Throughout the state, landslides swept into towns and buildings as sodden ground collapsed. More than 1 million people fled their homes. The weather might not have been the only problem in this case. Some have criticized local officials for not better managing the build-up of water behind local dams. But the flooding was ultimately traced back to heavier-than-usual storms during the summer monsoon. And it’s clear that such storms are carrying more moisture than they used to. The moisture in the air changes depending on temperature: heat that air by 1 °C, and it can hold approximately 7% more water. The Intergovernmental Panel on Climate Change has concluded that many parts of the world are already seeing increases in heavy precipitation, thanks to human-induced climate change. But the precipitation story turns out to be more complicated than that. A thunderstorm is essentially a tower of upward-moving winds that feed themselves by sucking in warm air from nearby. When the air rises high enough, it cools and condenses into rain. Storms can generate their own weather, such as creating cold pools of air near the ground that trigger more convection. And climate change can amplify these effects, causing updrafts to grow stronger and wider, which pulls in more warm air from surrounding regions and leads to more rain. 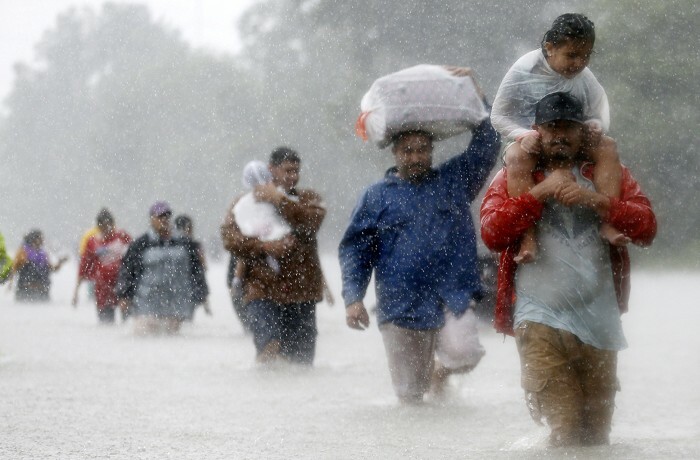 This apparently happened in Hurricane Harvey — the rainiest storm in US history, which drowned much of Houston and south Texas in a $125-billion disaster in August last year. Three separate studies have concluded that Harvey’s heaviest rains could not be explained simply by the increase of water vapour in the atmosphere1–3. Climate change made it even wetter than that. At NCAR, Pendergrass is working with global climate models to pin down what this might mean for extreme events in the future — and especially, where they might occur. She analyses how climate change is altering how heat and energy flow in the atmosphere, which changes how precipitation is spread around the globe. Last year, she and her colleagues reported on three computer simulations showing that precipitation is likely to become more variable across almost all land areas if temperatures rise through the rest of the century4. In other words, weather will get crazier: wet periods will give way to dry periods more erratically, and vice versa, across nearly all the continents. Now, she has drilled down to study the unevenness of precipitation — that is, the difference between a light drizzle and a torrential downpour. She and Reto Knutti, an atmospheric scientist at the Swiss Federal Institute of Technology in Zurich (ETH Zurich) in Switzerland, analysed global rainfall records between 1999 and 2014. For the median of all locations in the study, it took only 12 days for half of the year’s rain to fall5. “Things that are considered extreme contribute a lot to the total precipitation, more than a lot of my colleagues may realize,” she says. Looking ahead with a climate model, the researchers found that this kind of unevenness will increase. If greenhouse-gas emissions continue to climb quickly in the future, half of the extra rainfall will happen during the wettest six days of the year. That means more deluges — and the dangers that follow (see ‘Heavy rain’). Pendergrass has been talking with water managers in Denver, Colorado, who want to know how much flooding they need to prepare their dams to handle in the future. She says other areas should prepare, too. “Rather than assuming more rain in general, society needs to take measures to deal with little change most of the time, and a handful of events with much more rain,” she and Knutti wrote last month in Geophysical Research Letters5. Source: E. M. Fischer & R. Knutti Nature Clim. Change 5, 560–564 (2015). Another set of simulations underscores how society needs to prepare for these swings between wet and dry. This work, led by atmospheric scientist Zachary Zobel while he was at the University of Illinois in Urbana–Champaign, took a global climate model that usually calculates conditions every 100 kilometres and forced it to a much higher resolution, of just 12 kilometres. “You need as high a spatial resolution as you can get,” says Zobel, who is now at the Woods Hole Research Center in Falmouth, Massachusetts. At a resolution of 12 kilometres, the model can reveal small-scale phenomena in the atmosphere that are important for simulating storms. But Zobel’s model requires a lot of computing power, so the team looked only at the continental United States, not the entire globe. Even using a supercomputer, it took the better part of a year for the model to crunch through its calculations6. But in the end, the researchers got a detailed look at how different parts of the country would be affected, in both temperature and precipitation extremes, if greenhouse-gas emissions continue to remain high out until 2094. The scientists found that extreme precipitation events would increase over most of the country. They also spotted some larger changes in future patterns, such as in the position of the west-to-east jet stream that controls weather over much of the middle part of the United States. That change arises because the Arctic is currently warming faster than are the mid-latitudes, so there is less of a temperature difference between the two regions. In response, the jet stream shifts northward in the simulations, bringing warm moist air from the Gulf of Mexico behind it. The result is that the midwestern states, where the bulk of the country’s corn and wheat crops are grown, will probably see more severe storms each spring during the planting season. Meanwhile, dry spells will grow longer, the model suggests. “It really comes down to a boom-or-bust-type precipitation pattern,” Zobel says. “That will complicate how farmers deal with planting their crops.” The work appeared last month in Earth’s Future6. Today, Prein is an atmospheric scientist at NCAR and a leader in a new type of high-resolution climate modelling. This research aims to simulate future climate in even higher resolution than Zobel’s. Its computations narrow down to scales of four kilometres or less — which is so computationally expensive that it can be done only for relatively small regions. In ongoing work, UK-based researchers have been running European-wide climate simulations at 2.2-kilometre resolution and have spotted some warning signs about future storms. “At the moment across most of Europe, the season we get extremes is primarily summer,” says team member Elizabeth Kendon, a climate scientist at the Met Office in Exeter, UK. In the simulations of a warmer world, summer downpours get heavier, and extreme events occur later in the year. That suggests officials might need to do more to prepare for flooding from winter storms. Hurricanes are another major concern. Christina Patricola and Michael Wehner, at the Lawrence Berkeley National Laboratory in California, have used convection-permitting models to study the devastating hurricanes of Katrina in 2005 and Irma and Maria in 2017. They found that climate change had boosted rains within these storms by up to 9% — and that future warming would almost certainly mean more extreme rainfall from similar hurricanes7. One of the biggest convection-permitting simulations so far, run by NCAR, covered the continental United States at a resolution of four kilometres8. It was actually a pair of simulations, one looking back and another peering forward. The first one simulated global climate between October 2000 and September 2013 to test how accurately the model could reproduce what happened during those years. “We started as you would start a weather forecast, and then we just didn’t stop for 13 years,” says Prein. The second simulation looked at a similar period at the end of the century, incorporating factors that would be expected if society continues to produce greenhouse gases at a high rate. By comparing the two, the scientists could tease out the probable effects of increasing greenhouse-gas levels. And because the simulations were at such high resolution, they could capture how individual storms are likely to form and evolve in the future. Among the many findings of such models are that intense US thunderstorms will more than triple in frequency by the end of the century, and their maximum rainfall will increase by 15–40%9. The storms will also grow larger, almost doubling the area that would get hit with heavy rainfall. That has big implications for flood risks. “If you think about a large thunderstorm moving over a city area, it makes a big difference if the storm covers half the city catchment or all of it,” says Prein. He and his colleagues at NCAR are now developing a second set of simulations which they hope to begin running in the coming months. It will extend the simulations northwards into Canada, aiming to study whether the powerful thunderstorms that regularly rip through the upper midwest of the United States will move into Canada in the future. The work will also cover periods lasting 20 years rather than 13, which the scientists hope will enable them to capture longer trends in changing weather patterns. Correction 22 November 2018: An earlier version of this story erroneously located Elizabeth Kendon in Reading. Risser, M. D. & Wehner, M. F. Geophys. Res. Lett. 44, 12457–12464 (2017). Van Oldenborgh, G. J. et al. Environ. Res. Lett. 12, 124009 (2017). Wang, S.-Y. S. et al. Environ. Res. Lett. 13, 054014 (2018). Pendergrass, A. G., Knutti, R., Lehner, F., Deser, C. & Sanderson, B. M. et al. Sci. Rep. 7, 17966 (2017). Pendergrass, A. G. & Knutti, R. Geophys. Res. Lett. https://doi.org/10.1029/2018GL080298 (2018). Zobel, Z., Wang, J., Wuebbles, D. J. & Kotamarthi, V. R. Earths Future 6, 1471–1490 (2018). Patricola, C. M. & Wehner, M. F. Nature 563, 339–346 (2018). Liu, C. et al. Clim. Dyn. 49, 71–95 (2017). Prein, A. F. et al. Nature Clim. Change 7, 880–884 (2017).